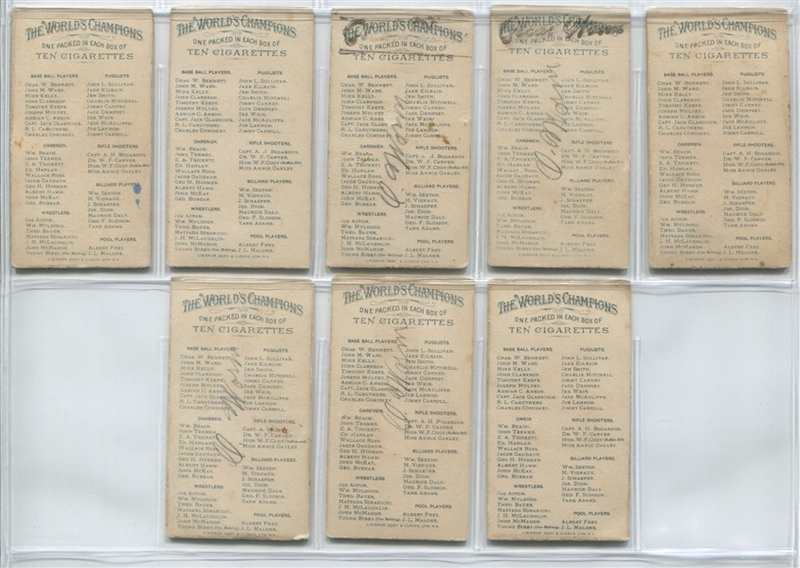 Arguably the most collected set of Allen & Ginter cards along with the N2 Indians, the N28 World's Champions are a beautiful set of 50 cards. The set contains athletes from a number of different sports including 10 baseball players as well as boxers, pedestrians, wrestlers, oarsmen, billiards players and rifle shooters. 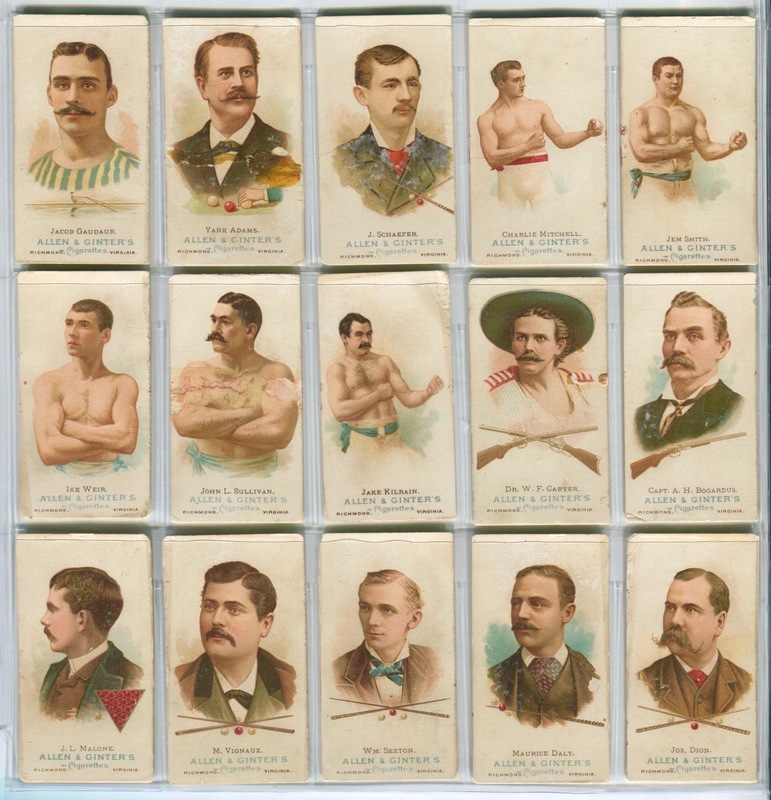 Among the more famous non-baseball players in the set are Buffalo Bill, Annie Oakley, Jack Dempsey, Jake Kilrain and John L Sullivan. The 10 baseball players contain 6 players who were subsequently inducted into the Baseball Hall of Fame including John Ward, Adrian "Cap" Anson, John Clarkson, Charles Comiskey, and Mike "King" Kelly. 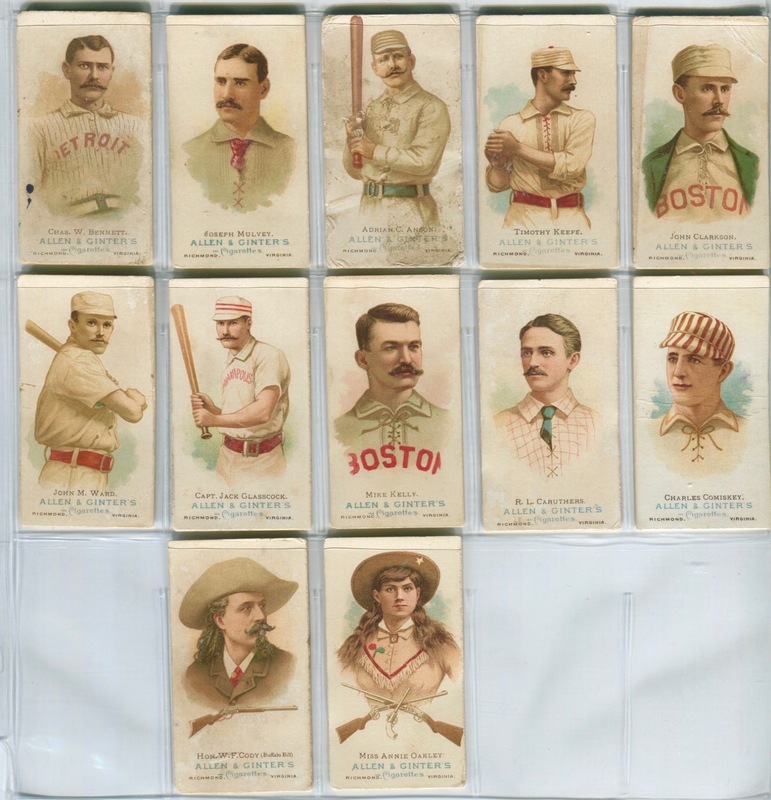 Although this set is a lower grade set, it is complete and there are clean cards in the overall set as well as the baseball subset. This is a rare opportunity to get a collector grade complete set of the N28 World's Champions first series. Overall, the set is pretty even and displays as a G to GVG set with mostly a mostly clean look. The set breakdown is (15) cards in VG to VGEX condition and (35) cards in P to G condition. 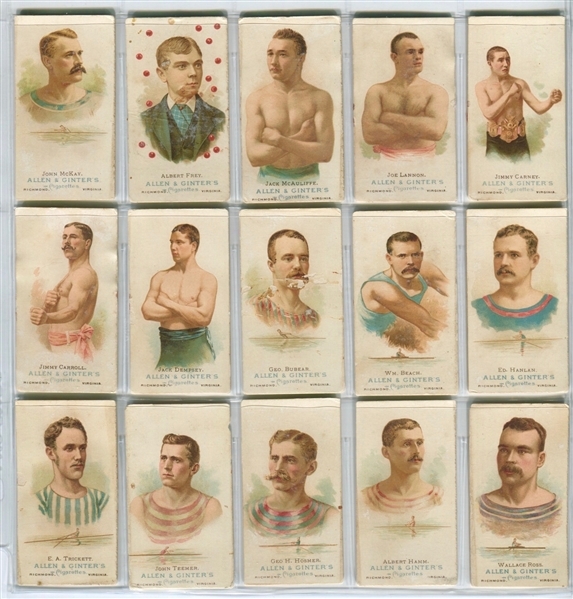 Many of the card backs look to have "Oscar Worm" on them. 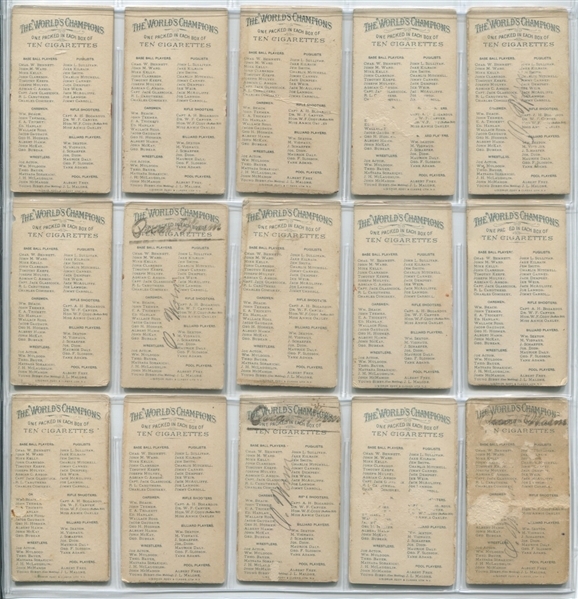 Some written in pencil and some stamped at the top over the "World Champions" masthead, some have both the pencil writing and the stamped name. 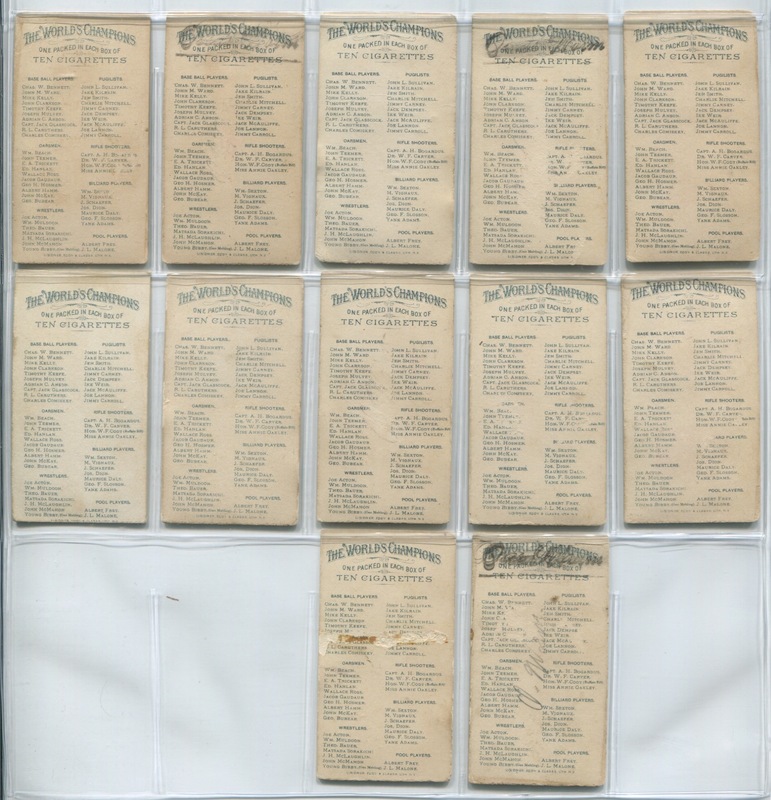 The total with these back issues is (15) cards including Keefe, Mulvey & Buffalo Bill. Back damage between 5 and 15 percent affects (13) cards including Oakley, Glasscock and Mulvey. 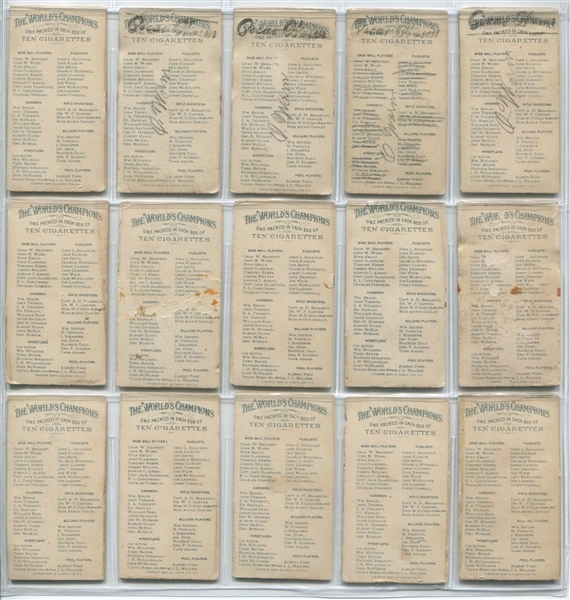 Of the 13 cards with back damage, two of those coincide with the ones above with writing or stamps. 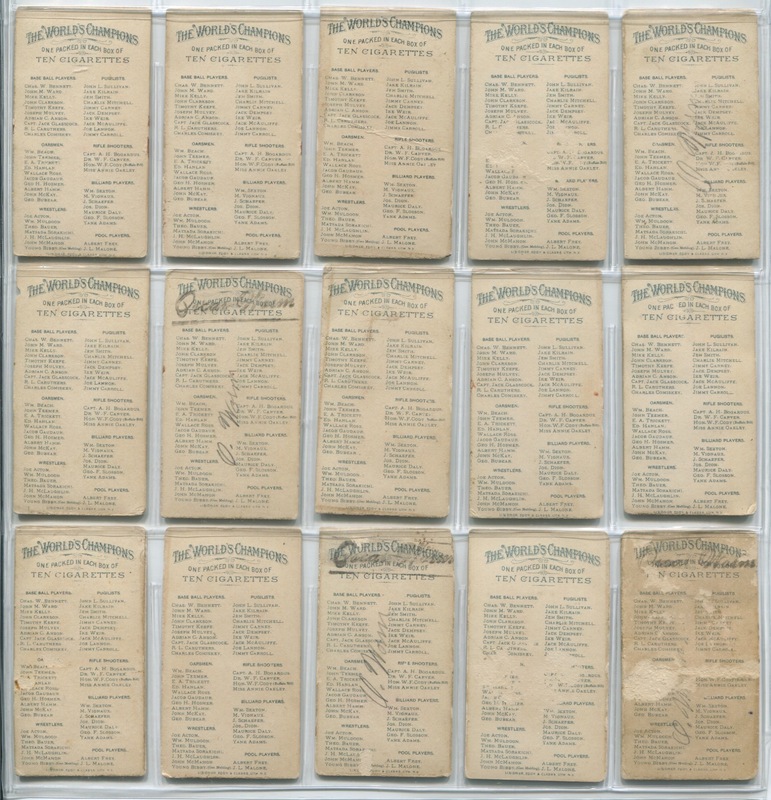 A total of (26) cards have some type of back issue. 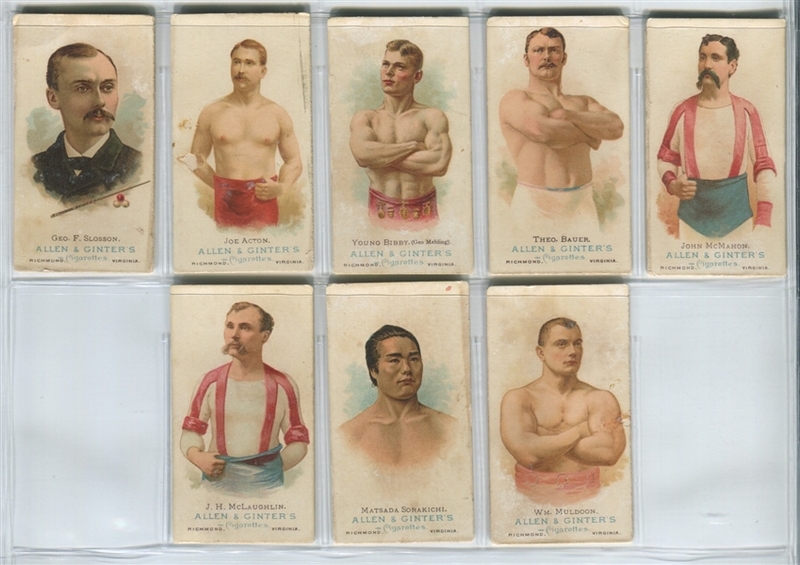 A very few cards have some type of front damage with surface paper missing but they total (5) cards including John L Sullivan, Bubear, Yank Adams , Daly and Anson. 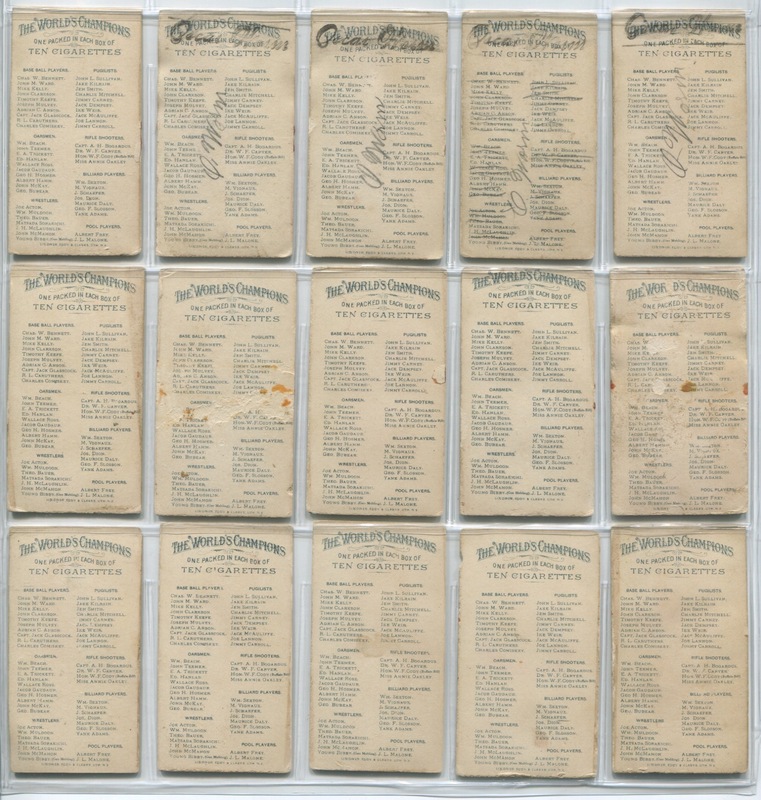 A few of the cards have some discoloration on the front as if they were exposed to the sunlight or something and darkened them to a small degree including Clarkson, Keefe and Ward. 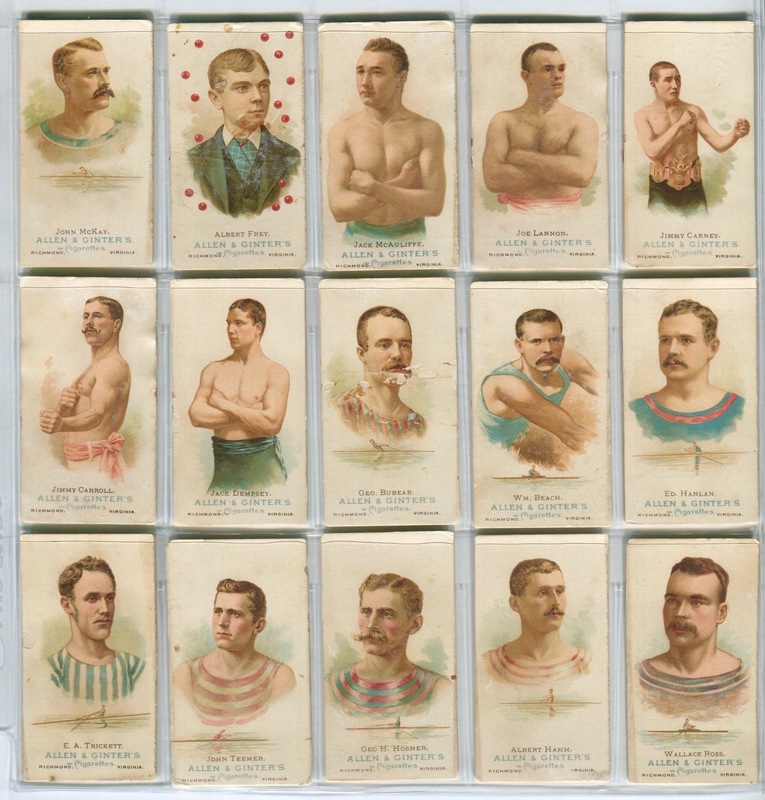 Overall, the (10) baseball cards, with the exception of Anson, display in most cases better than the rest of the average cards from the set. Caruthers, Kelly, Comiskey and Keefe are probably the best conditioned baseball approaching or attaining VG condition. A question arose about measurments on the Mike Kelly card. It measures 1/16" narrow. All the cards in the set measure good top to bottom but the Kelly, Weir and Kilrain seem to be 1/16" narrow.